It seems one dolphin can call another specifically by mimicking the distinct whistle of that other dolphin. "These whistles actually turned out to be names. They're abstract names, which is unheard of in the animal kingdom beyond people," said Randall Wells, one of the authors of a new study on dolphin behavior, told CNN affiliate WFLA-TV in Tampa, Florida. Wells, of the Sarasota Dolphin Research Program, worked with scientists from the University of St. Andrews in Scotland, the Woods Hole Oceanographic Institute in Massachusetts, the Chicago Zoological Society and the Walt Disney World Resort, on the study of what they call "vocal copying" in dolphins. It was published last month in the Proceedings of the Royal Society B. "Each dolphin produces its own unique signature whistle that describes its individual identity," the researchers said in a University of St. Andrews press release. "The new study suggests that in fact dolphins are mimicking those they are close to and want to see again." To conduct the study, the researchers listened to recordings of about 250 wild bottlenose dolphins made around Sarasota Bay from 1984 to 2009. Captive dolphins at the Seas aquarium at Disney World were also recorded. Five volunteers listened to the calls to distinguish the matches. Researchers found that dolphins that were familiar with each other for a significant amount of time would mimic the whistle of another in that group when they were separated. Whistle copying was not found in dolphins that happened to cross paths in the wild, the report said. "The fact that animals are producing whistle copies when they are separated from a close associate supports the idea that dolphins copy another animal's signature whistle when they want to reunite with that specific individual," Stephanie King of St. Andrews said in the press release. Additionally, the mimicking is not frequent, the researchers said. "Frequent copying of signature whistles would ... render the identity information of the whistle unreliable," the study said. "The rare copying of signature whistles may, however, be particularly suited to addressing close associates." 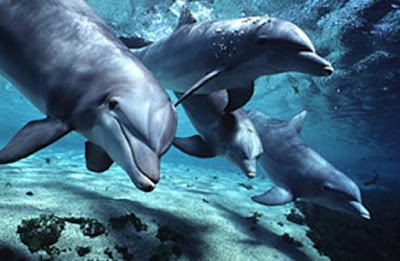 The whole vocal experience puts dolphin communication closer to that of humans than any other species, the report said. "The bottlenose dolphin signature whistle stands out in that it is invented by its main producer and can only be shared by animals who had experience with the inventor. Besides humans, bottlenose dolphins appear to be the other main example of affiliative copying with such individually specific learned signals," it said. Wells said it all makes perfect sense when the bottlenose dolphins are swimming about in the Gulf of Mexico. "These animals are living in a murky, estuary environment. They have to maintain group cohesion and stay in contact with one another and coordinate their activities -- how do you do that when you can't see one another?" WFLA quoted him as saying.